If only we could make the theme music play, too. For those of you attending a midnight IMAX show of Brad Bird's Mission: Impossible Ghost Protocol this week, Paramount has a treat for you. 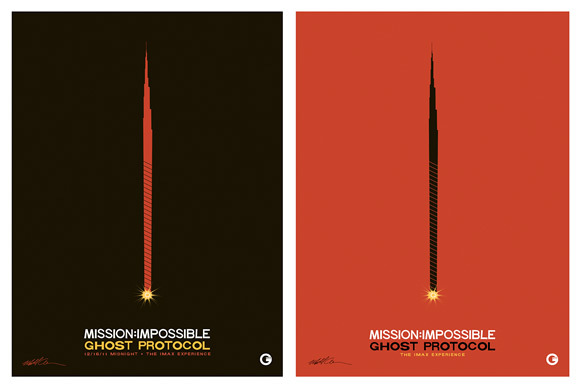 IGN has debuted a minimalistic art poster designed by Matt Owen (through Gallery1988) specifically for the midnight IMAX openings, and apparently "anyone attending" the midnight IMAX events can/will get one of these - sweet! But it might be a totally different color, as they say this version they've got is the "black background" version and it comes in red and black. So it's red? This message will self destruct in five seconds… please view now! Mission: Impossible Ghost Protocol is directed by Oscar winning filmmaker Brad Bird, of animated films The Iron Giant, The Incredibles and Ratatouille previously. This stars Tom Cruise as Agent Ethan Hunt along with a supporting cast including Jeremy Renner, Simon Pegg, Josh Holloway, Tom Wilkinson, Paula Patton, Léa Seydoux and Michael Nyqvist. Producer J.J. Abrams crafted the story with Cruise, and writers André Nemec and Josh Applebaum (both of "Alias", "Life on Mars") penned the screenplay. 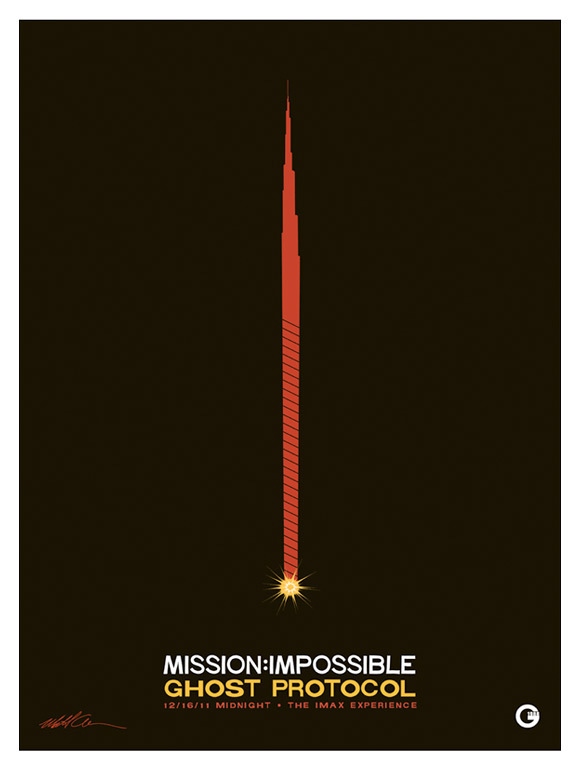 Paramount is bringing Mission: Impossible Ghost Protocol to theaters and in IMAX starting December 16th this winter. It kinda looks like a Saul Bass design, doesn't it? This poster reminds me of Bird's other films. It definitely gives you a sense of who the director is. For who ever doesn't know this, the top of the flame is the Burj Khalifa, the tallest tower in the world. We know. Its mentioned in every interview, tv spot, and promo... because Dubai pretty much financed the movie (speculation on my part).